The shoulder is an immensely complex and inherently unstable structure, so injuries to this joint are quite common. Here, we discuss a few of the possible causes of pain in this area, including frozen shoulder syndrome, and how Chiropractic can help resolve them. Before we start discussing what can go wrong, let’s take a moment to admire the structure that is your shoulder joint. It is made up of your shoulder blade, your collarbone and your upper arm bone (humerus) plus a lot of ligaments and muscles that hold them all together. It really is quite amazing – think of the mobility that a healthy shoulder can achieve. It can arc forwards all the way until your arm is straight up; it can go a long way behind you as well and then there’s that incredible feat of being able to take your arm out away from your side until your hand is once more pointing at the ceiling. Not to mention the twisting – tuck your elbow into your side, bent at 90 degrees, and you can take your forearm right across your front and then all the way out until you thumb is practically pointing behind you…and any combination of those movements! There is no other joint in the body which will allow you to move in just about any direction the way the shoulder will – you can describe almost a full circle forwards to backwards with your arm straight beside you. But all that flexibility comes at a price, and that is stability. Or lack thereof. The less stable a joint is, the more prone it is to injury because the stresses put on the soft tissue are much greater. Almost everyone at some point will notice that their shoulder is starting to crunch and click as they move it around – just try rolling your shoulders and I’m sure you’ll understand what I mean. As long as it doesn’t hurt when it makes these noises, we tend to just accept it happens and ignore it. If it causes pain, though, then that suggests it’s something more than just the normal crunches we all get from time to time. Joint-wise, there are two main joints that we assess for restriction – the joint with the end of the collarbone, and the joint between your humerus and the rest of the shoulder structure. Your Chiropractor may also assess the movement of your shoulder blade against your rib cage. Restriction in any of these joints can obviously cause pain, but can also lead to a much wider problem. For example, if the joint between your collar bone and the rest of the shoulder complex is unable to move freely, other structures will have to compensate for this in order to try and maintain full movement in your shoulder. This adds to the already considerable stresses on these other structures, and the initial injury starts to spread to other areas. This is why it is vital to address problems with the shoulder joint sooner rather than later – the longer you leave it, the bigger the problem, and the more likely that permanent damage will have been done. As far as muscles are concerned, there are literally too many to worry about individually, so we tend to address them more in terms of what has happened to them than focus too much on actually giving the injured structure a name. An internationally renowned shoulder surgeon once admitted to a group of Chiropractors that in his view it was pointless to try and pin down exactly which muscle was causing the problem, because the fibres of the individual muscles tend to become mingled and confused to the point it is almost impossible to distinguish one from another. Hence the phrase “rotator cuff injury” has become prominent – the rotator cuff is actually a group of four muscles surrounding the shoulder joint, but to try and pin down which one of those four is causing the symptoms you are experiencing is simply a meaningless exercise. There are also many other muscles which are peripherally involved in moving the shoulder which can also influence the complaint which has brought you in to Shifnal Chiropractic Clinic in the first place. It may be that these muscles have been pulled or strained by incorrect or repetitive movements, or it is even possible to completely rupture the tendons or ligaments around the joint, which will require careful management if you are to regain the full use of your shoulder. Of course, as discussed in the articles on neck pain and upper back pain, it is possible for the pain to actually be originating elsewhere. It may be there is irritation of one of the nerves in your neck which is sending pain into your shoulders, or it could be that your internal organs are sending pain to the area. The most common transitory example of this is when you get a really bad stitch, you can often feel the pain into your collar bone or across the top of your shoulder as well. There is no physical reason for this – it is what is known as referred pain. Part of your Chiropractors job is to ensure that they know exactly which structure is causing the pain – is it a local muscle or joint, a distant nerve that can be helped by Chiropractic or something that requires different care such as gallstones. 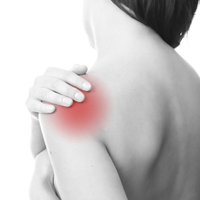 One of the most common complaints that Chiropractors see is that of “frozen shoulder”. More properly called adhesive capsulitis, this is a condition of the shoulder that is difficult to define and manage, but which appears to originate in the soft tissue around the shoulder joint. Generally, this complaint affects people who are over 40 years of age, and there are 3 stages to its development. Painful phase – the symptoms usually come on slowly and for no particular reason, but are usually felt as shoulder pain on movement and a background ache across the shoulder region. It is often worse when the shoulder is rested and at night, and towards the end of this phase there is a noticeable stiffness. Adhesive phase – this usually takes place after several months of pain. The pain alters, becoming less severe and less frequently occurs at night; however the severe pain at the limits of movement persists. Shoulder movement becomes even more restricted during this phase. Resolution phase – often, there is very little pain during this stage; the shoulder just won’t move! Gradually, this does start to get better, but the start of recovery and the rate of progression vary from person to person. Even if left totally to its own devices, frozen shoulder or adhesive capsulitis will generally resolve itself in 1-3 years, but nobody wants a semi-functional and painful shoulder for that long. If caught early, a course of intensive treatment produces the most effective results. Your Chiropractor will work with the soft tissues in the area, gradually working through various movements to try and maintain the mobility, and suggest some exercises for you to work through at home. As well as this, it is often helpful for you to take anti-inflammatory medication such as Ibuprofen, and treat the affected shoulder with ice. Once this first stage of treatment is over, the focus is on improving the range of movement in your shoulder, through a variety of techniques. Again, you will be asked to do a few exercises at home, with specific aim of strengthening muscles that have become weak during the course of the complaint. So shoulders are by their very nature prone to injury, and it is extremely important that problems are addressed as soon as possible to prevent any long term damage. Chiropractic is very helpful in doing just this, so please feel free to contact us to arrange a free consultation or book an appointment.